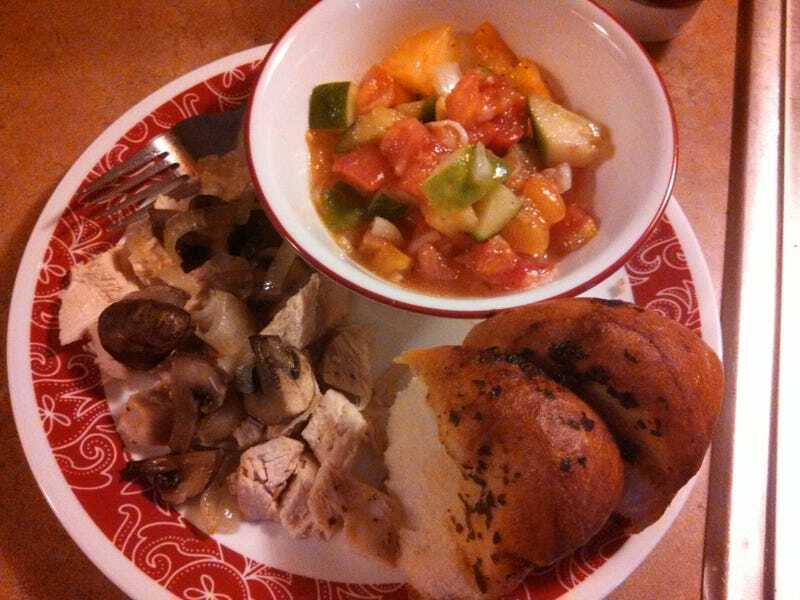 Baked chicken with mushrooms and onions, garlic bread, and tomato salad (recipe follows). Those who can't have garlic bread got baked potatoes. I went to the farmer's market yesterday, and got 5 huge tomatoes (over a pound each!) and a massive cucumber for $4. So, of course, I made my version of a Greek village salad. Put all of the above in a jar and shake vigorously (or a bowl and whisk til well combined). Pour over veggies, toss well, cover, and put in fridge for a few hours. Devour with good bread to sop up the sauce, or toss with cold noodles for a pasta salad. Add some feta or goat cheese crumbles, if you want!